The book is Who Says That’s Art? : A Commonsense View of the Visual Arts, by Michelle Marder Kamhi. It was recommended by a friend who’s also a friend of the author. The author herself is an independent scholar and co-editor of the (now online) journal Aristos. She seems to be somewhat of a Randian, at least on aesthetics. It’s worth noting that Jacques Barzun lavishly praised her earlier (co-authored) book What Art Is: The Esthetic Theory of Ayn Rand. Roger Kimball also said some nice things about it, a generous gesture since she’s strongly anti-modernist and The New Criterion is very much the opposite. A sign of the times is that the book doesn’t include the images she discusses but refers you to a website where they’re all collected. It’s probably not a bad idea–you save money on the book and get much better images. Also, most people who read the book probably have a tablet or whatever. I’m pleased I read it. It’s clear, informative, perceptive, well-written, and jammed with info that doesn’t get played up in the official histories of twentieth century art. She’s certainly done her homework. The quotations alone are worth the cost of admission. I’m not going to review it though, if only because I lack the background to compare it with other books of the same general type. Instead I’ll go off on tangents suggested by what she says. I’m more tolerant than she is of some of the figures she pans, e.g., Rauschenberg. I agree he’s no Vermeer or whatever, and shouldn’t be taken overly seriously, but he has talent and I like looking at some of his things (at least briefly, occasionally, and in images rather than reality). I agree though that celebrating him for helping un-define painting, or destroy the concept of art, or however they put it, is ridiculous. You don’t get good philosophy out of marginal cases, as I think she says, and they usually don’t go much of anywhere. If someone does something odd you shouldn’t make that the new normal. On the other hand marginal cases can be diverting, suggestive, amusing, etc. Also, there’s something to be said for unsettling categories a little now and then. We need them but it doesn’t pay to be overly literal-minded about them. That’s why we make jokes. The modern tendency is to take everything literally and then try to extract universal rules from marginal cases. That works in physics, where people create artificial or extreme conditions to “put nature to the question” (as I think Bacon said), but not so much in other settings. Since there’s no perfect definition people give up on definition altogether. The result is the idea that art is whatever an artist says is art, which is stupid and leads to diminishing and even negative returns. I think more could be said on what causes the current situation. She attributes it to pretentious insiders and crude rich people throwing their weight around and bidding up prices. But how are those people able to define the situation? A more basic cause is the implicit nihilism of modern life. You can’t have an essence of art if there aren’t any essences, and you can’t have art that expresses the good, beautiful, and true if those things don’t exist. Instead you’ll look for some other way to define what you’re doing and make an impression–shock, novelty, debunking, inside jokes, visual and conceptual aggression, whatever. I agree with her that there are a lot of good artists today who don’t get much attention. I like going to the Gowanus Art Show here in Brooklyn for that reason. The basic rule today seems to be that if something cultural is considered important, Damian Hirst or whoever, it has to be appalling because otherwise people will say it rings false. If not, it’s allowed to be good. You can see the same situation in genre fiction, which is allowed to have all the traditional good qualities of fiction. The author wants to maintain the distinction between art and decoration. It’s art if its primary function is expressing ideals, values, etc. through imitation. If there’s some other primary function then the “art” is actually decoration. So the object has to be imitative and primarily an object of contemplation rather than use. There are obvious polarities, but clear distinctions can be hard to maintain. When do murals or sculpture on cathedrals stop being decoration and become art? How about paintings hung in a living room? Manuscript illumination? Maybe when the murals etc. become something people contemplate separately from the overall ensemble. So I suppose she’d have an answer on that point. It seems odd though to exclude architecture from art, as she does, since it can function as an object of contemplation. The great cathedrals mostly function that way today (alas), and their facades always did. That’s true even though they don’t normally imitate much of anything. If a mural can be art, why not a facade? Also, the expressive form of a work of art sometimes seems a lot more important than the particular thing imitated, or for that matter the supposed practical function, as is often the case with Romanesque capitals. The literal image seems to work the way Eliot said the ostensible meaning of a poem works, as a bone to distract the watchdog of the mind. Clive Bell goes on and on about that type of situation. She appeals to the universality of art as she defines it, and there seems to be something to that. The Chinese for example seem to have taken a view similar to hers on the nature of art. The great artistic works of the Hindus though were religious images that originally had a practical ceremonial function. Ditto for a lot of what the Greeks did. If that counts as art, why not cathedrals? One could say that the ceremonial function of a religious image is contemplative, since people look at it and see something divine, but the function of a cathedral is to create a sacred space and focus attention on the divine as well, so the differences may not be so great. The Muslims in contrast are iconoclasts, and Islamic art basically seems to be 100% design and decoration. Does that qualify as art for her? 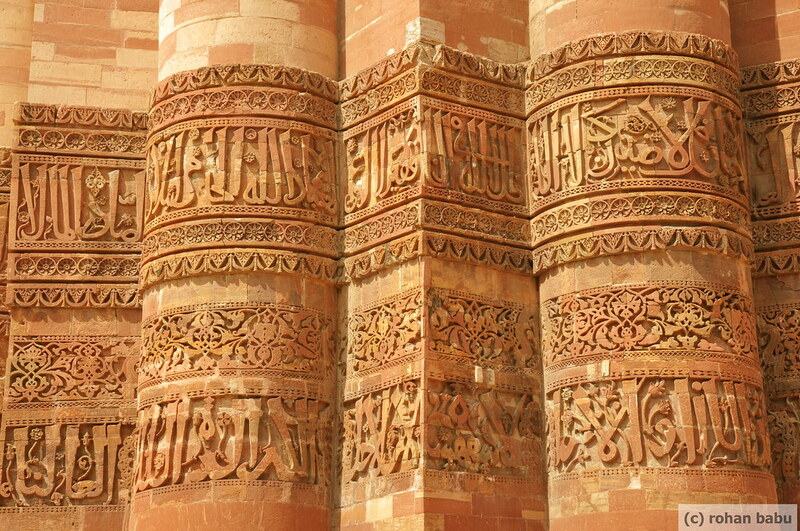 How about the Qutb Minar in Delhi, which is both architectural and Islamic? It’s odd to think of the functional aspects (providing a tower from which to call the faithful to prayer) as primary and the expressive as secondary. I suppose I’m mostly just grousing that her definitions aren’t always obviously perfect, which is silly as a complaint but maybe justifiable as a way of testing the inevitable limits of what she says. I am a bit puzzled though by the idea of a secular icon, which seems to be her idea of art, in a world without real icons. There’s a modern tendency to turn art into a religion, so maybe the attempt to abolish a clear concept of art is part of a general iconoclasm motivated by the impossibility of an object of contemplation for people whose conceptual system lacks transcendentals. For people in that position art as religion and indeed art as art in her sense just isn’t possible so they want to debunk it. I suppose the debunking tendency is still bad, since a deficient religion is better than aggressive unreligion, which is what we have now. The artworld doesn’t seem to want a better religion, it wants no religion at all. You have to start somewhere, and in the Year of Grace 2015 even a deficient religion points in a better direction than where we are. In grappling with the ideas in Who Says That’s Art? , you’ve paid me the best compliment any author should hope for—that is, serious and thoughtful attention. That you found the book “clear, informative, perceptive, well-written, and jammed with info that doesn’t get played up in the official histories of twentieth century art” is gratifying indeed. I especially appreciate your noticing that last item. Let me return the compliment by responding to the points you’ve raised. Your overriding question regards the ultimate cause of the current breakdown of values and standards in the artworld. Like many, you attribute it to the “implicit nihilism of modern life.” I fear you’ve misread me, however, in thinking that I assign it to “pretentious insiders and crude rich people throwing their weight around and bidding up prices.” I see such forces as secondary, not primary. In my view, the problem stems ultimately from ideas—that is, the professional artworld’s mistaken ideas about the nature and purpose of art. As traced in the book, from the invention of “abstract art” in the early twentieth century on, those ideas have become more and more irrational and detached from human reality. And as I indicate, the practice of many would-be artists has been driven by those false ideas. As for today’s most prominent collectors, they don’t make independent judgments. They simply follow the line taken by the experts, and by other prominent collectors. Support for my view lies in the gaping chasm between ordinary art lovers and artworld experts on the subject of “contemporary art.” If the general “nihilism of modern life” were the cause of art’s breakdown, why would so many ordinary people be deeply troubled by the “art” promoted by the experts? And why would so many artists continue to create work that is not nihilistic? I cannot claim that I love the art that has occasioned my philosophy with anything like the same intensity or in anything like the same way in which, for example, I adore the Dutch masters. Aesthetically, I suppose, I might be willing to trade it all for Giorgione’s La Tempesta . But … good philosophy is generated by hard cases. And good philosophy of art [is generated] by red monochrome squares and [Warhol’s] Brillo Boxes . A prudent philosopher would have sought reasons for such discrepant feelings. Danto did not. Instead, he contributed to the “institutional theory of art”—which holds, in effect, that art is whatever a purported artist claims it is. Regarding “the distinction between art and decoration” (more precisely, between “fine art” and “decorative art”), you ask “When do murals or sculpture on cathedrals stop being decoration and become art?” Your own answer is essentially correct: “when the murals etc. become something people [can] contemplate separately from the overall ensemble.” Michelangelo’s Sistine Chapel frescoes are indisputably “fine” art for that reason (as well as for their mastery and depth of expression), even if they originated in Pope Julius’s request to “decorate” the ceiling. On the other hand, Michelangelo’s candelabra is a piece of decorative art. What about the cathedrals themselves? For many, they are the quintessential instance of “architecture as art.” Much as I’ve been awed by the great ones I’ve visited, however, I’d argue that their meaning is conveyed primarily by the art attached to them (the sculpture, frescoes, and stained glass windows), as well as by one’s awareness of their sacred function—not by their architectural form per se, which primarily fulfills the physical function of sheltering the worshipers and sacred objects within them. Applied to an office building, for example, how awe-inspiring is or would be the same form? For such reasons, I classify cathedrals (like all works of architecture) as a species of design, not fine art. As for imagery with a ceremonial function, that function is spiritual, not physical. In that case, there is no tension between disparate functions. By contrast, in designing a cathedral, the architect must attend to many aspects that relate to the physical function, not the meaning. How do I view nonfigurative Islamic art? It should be classified as “decorative art,” not “fine art”—the latter being, by definition (in my view), mimetic. The very existence of iconoclasm, I would add, testifies to the distinctive power of mimetic art. I’m not sure what you mean by “a secular icon” as my “idea of art.” All (fine) art, in my view, embodies important values and ideas. I agree with Rand, however, that religion is not their only source. As an atheist, she held (like Aristotle) that human flourishing requires a hierarchy of values—she chose to base hers on reason rather than faith. Be that as it may, she maintained that all art, whether secular or religious, serves to embody value-laden ideas of long-term importance to the individual, and by extension to society. My thanks to you for your questions, and for this space in which to answer them. On “secular icons”: the thought was that if there are objective goods there’s a hierarchy of goods and some highest good that somehow causes or includes or at least coordinates and completes and perhaps explains and validates the subordinate goods. We’re dealing with a system of goods rather than particular isolated goods. So in a healthy artistic culture, in which art expresses important objective human values (a.k.a. goods), the highest art will express most perfectly the summum bonum or at least something clearly oriented toward that. But that’s just what icons do. My puzzlement then is what happens when there’s no understanding of the highest good that’s symbolically definite enough to play its fundamental cultural role and provide a focal point for art–that is, what happens in a culture that rejects God? It seems to me that the system of art as expression of objective values gets decapitated. The highest art has nothing to be about, so it becomes nihilistic, merely decorative, an act of aggression, concerned purely with technique, or whatever. And that’s what we have now. Normal people and normal working artists retain their natural human orientation toward objective goods and their expression, but as you go up the cultural food chain that gets shakier and shakier because there’s no accepted justification for thinking such goods exist. So big-deal theory and big-deal art become inhuman anti-art. They still express the culture’s highest vision but that vision is now nihilistic. I suppose a piece of evidence for my view is the tendency of Islamic and traditional Jewish art toward pure decoration. Their idea of God is too transcendent for visual art to be relevant. The Catholic doctrine of the Incarnation and emphasis on sacramentality in contrast have meant lots of high-end visual art. On less grandiose matters, I’m still mulling over the art/decoration and imitation/expressive form issue. I think my best example is Romanesque capitals, where the imitation seems somewhat an excuse for the presentation of expressive form. Also analogies to other arts–grand opera’s an artwork that’s an assemblage of overture, songs, choruses, visuals, dramatic situations etc. that presents an overall vision. So why not a cathedral? You experience the Gesamtkunstwerk by entering the building rather than sitting in a concert hall, but that doesn’t seem a difference of principle. And the primary practical function served is ceremonial, as in the case of many Greek and Indian statues. For serious artists without a strong religious commitment, the principal secular icons are of humanity—representations of human character, courage, love, friendship, etc. While such images may lack the transcendent gravity of divinely inspired images, they are not trivial. (Let’s remember, too, that images of the divine are invariably cloaked in human form.) The natural world also presents meaningful subjects. While it’s tempting to ascribe the artworld’s anomie to nihilism in the culture at large, I think it is a misreading of the actual state of affairs. As one reviewer of my book has noted, the contemporary artworld is a remarkably insulated, self-referential sphere—a “self-satisfied little world” cut off from normal intellectual standards. And how would you account for the fact that one of the most successful pseudo artists was Andy Warhol—who happens to have been an observant Catholic? In addition, the influential postmodernist Sol Lewitt was, I’ve been told, an Orthodox Jew. And John Cage’s antics (which greatly influenced Rauschenberg, among others) were said to be inspired by Zen Buddhism. As with other leading figures in the dysfunctional artworld, I maintain, the unprecedented creations of those individuals were influenced mainly by cockeyed ideas about art and artists (augmented by their personal psychological problems), not by cultural nihilism. Their own statements about their work (as quoted in my book) tend to back me up. Your lingering questions about cathedrals have more to do with epistemology than with esthetics, I think. Even if we grant that cathedrals are a distinctively meaningful assemblage, then your new category of fine art becomes “cathedrals,” not “architecture.” Moreover, regarding your proposed analogy with opera, what aspect of opera corresponds to the essentially utilitarian aspect of a cathedral? None, I think. Finally, your reference to “the primary practical function” of ceremonial art departs from what I defined as the primarily physical function of decorative art. The figurative sculptures on Romanesque capitals strike me as a marginal case, in which one can easily mentally isolate the figures from the capitals’ functional role as architectural supports. It’s a pleasure to receive such intelligent responses. Not surprisingly, though, I maintain my own views. I agree there are generally human values that are not specifically religious. My point has to do with the dynamic that sets in when the specifically religious is excluded. In view of the systematic and symbolic nature of human thought, what happens to these human values when there’s no highest good to which a concrete symbolism is relevant? Do representations of generally human values, courage, love, or whatever, survive such a situation, or does the lower and particular eventually conform to the higher and more general, which is now viewed as illusory or at least incapable of representation? Moving on to other matters, an enduring elite necessarily fits in rather well with the overall social ecology. It’s no doubt true that many admired artists have personal issues, but why do the guys with issues become admired? They must fit the tendency of things in some way. We’ve had the current artworld elite for some time now, so it’s probably not just a fluke. It seems to me that its “self-satisfied little world” matches the increasingly radical opposition between elites and ordinary people generally. That opposition seems to prevail in academia, politics, and business as well. It’s not a specialty of the visual arts. And the worldly powerful are happy with the situation. Zillionaires and governments evidently find that starchitect designs, with their inhumanity and indifference to natural responses, and their implicit aggressive debunking of how ordinary people think and feel, fit in perfectly well with their felt relation to the rest of the world. It’s triumph of the will all the way, rather than contemplation of the good, beautiful and true or concern with the public good. It seems to me that’s a tendency of modern thought cause by rejection of any authoritative transcendent. Religion has an odd position in an anti-religious public culture. What usually happens is that fragments of religious thought or feeling become awkwardly embedded in something very different. (That’s why religion is considered so irrational today.) Which part of the resulting ensemble has effect depends on circumstances. And in his career Warhol responded to the demands of the dominant high-end view. Religion can change quite radically under such circumstances. I have no idea what Warhol’s Catholicism amounted to. I knew one young woman though, just as an example, who counted as intellectually high-end and was assertedly Catholic, but whose Catholicism seemed mostly to amount to an aesthetic cult of suffering. The philosophy implicit in modern public life isn’t something anybody can really live by. It leaves out too much. So everyone has a private way of cushioning the blow even though his public pronouncements, if he’s the sort of guy who becomes prominent, hew to the accepted line. For me the striking thing about Romanesque capitals is that expressive form seem clearly to outweigh imitation and structural function in importance. I suppose I should reread Clive Bell on the topic. He claimed that people who care most about art don’t much care about what it is that’s imitated, just expressive form (I don’t recall if he used that term). So for him the example wouldn’t be marginal but central. To me it seems that art can go either way. There’s the icon, or Marriage of Figaro, where representation of non-artistic values through imitation is the key, and there’s also something more abstract, like most music but very little literature, where representation doesn’t play much of a role. I agree there’s not much purely non-representational painting or sculpture that works all that well as painting or sculpture. The very best seems to be iconic in some sense. And it’s easier for objects with some physical use to be non-representational and still of the highest aesthetic quality. Even so I agree with Bell to the extent that the particular thing represented often doesn’t matter a lot (although sometimes it’s absolutely central). And the physical use can be minimal, as in the case of the Qutb Minar. Perhaps my responses have not been sufficiently intelligent, as I’ve failed to persuade you! But I’ll try here again, by responding to the latest set of questions you’ve raised. 1. Can a purely secular art ever attain the sublimity of art that is religiously inspired? (your point, in my words). Frankly, this is a question I’ve often asked myself—atheist though I am. I’m not sure. But I am certain that art which is not religiously inspired can be of high quality and moral value. A case in point is Andrew Wyeth’s moving portrait of Christina Olson —his severely crippled Maine neighbor, who was also the subject for the better-known Christina’s World . Choosing here to emphasize her dignity and strength of character, rather than her deformity and handicap, he created what I view as a profoundly meaningful secular image. The essential factors in the creation of such a portrait—apart from Wyeth’s exceptional talent and skill as an artist—were his hierarchy of values (implicit in his deep admiration and respect for Christina’s staunch independence in the face of great adversity) and his strong emotional connection to the subject. Those factors are essential for all meaningful and effective art, whether secular or religious. Both of those questions relate to the cockeyed ideas about both art and artists that have increasingly dominated the artworld since the invention of “abstract art” in the early twentieth century. It is clear from Warhol’s biography that what he most aspired to was “making it” in the world of “fine art” (rather than simply continuing as a highly successful commercial artist). Ironically, “making it” in that world no longer required making fine art, because the very idea of fine art as skilled and meaningful imagery had, by mid-century, been abandoned, leaving nothing in its wake but confusion. Again, I attribute this breakdown to the failure of secular philosophy—in particular, to the total relativism of postmodernist thought. And I’m prepared to agree with you that it infects other spheres of contemporary culture. But without clear evidence of cause and effect, I’m reluctant to ascribe it ultimately to the abandonment of religion. 3. What is “expressive form” and how does it relate to Romanesque capitals? [He] indiscriminately applied his concept of “significant form” to a Persian bowl, a Chinese carpet, the architecture of the Hagia Sophia (the magnificent sixth-century Byzantine church in Istanbul), and the fresco masterpieces of Giotto [and] Piero della Francesca… . If all that was needed in art was “significant form,” devoid of all representational or emotional content, then a porcelain vase might be just as admirable as Michelangelo’s Sistine Chapel ceiling frescos. So I would definitely not recommend re-reading Bell! Your point about “aesthetic quality” is a separate issue, one that was muddied by Bell’s “significant form.” For example, the Qutb Minar, viewed in its entirety as an architectural object, does not represent anything. Only when one gets close enough can one see its marvelously “aesthetic” calligraphic ornamentation. Moreover, the meaning of that ornamentation is not conveyed with the psychological immediacy possessed by imagery. One must decipher the symbols in order to grasp the meaning. So I see no contradiction in classifying the Qutb Minar as a work of architecture, not “fine art”—bearing in mind that works of “fine art” convey meaning through imagery. 4. If music can be nonrepresentational, why can’t visual art be abstract? Mimetic representation is not in itself the goal of [fine] art. [But] it is the indispensable means by which [such] art performs its psychological function. Your responses have been plenty intelligent, I just remain puzzled over whys, wherefores, basic categories, and what things function how. As to art, religion, cockeyed philosophy, etc., it seems to me we differ in our degree of individualism. You seem to tend toward the view that each person has a particular philosophy, and his outlook and actions reflect that philosophy. There’s a lot to that, of course, but I’m more conscious of limits on that due to the mass of habitual assumptions and understandings we absorb from our background. A Catholic in an atheist culture is going to find it very hard to be Catholic through and through, and conversely. Also, something like what kind of art people expect, respond to, and find it natural to produce will depend enormously on the assumptions and understandings that pervade their social world. When I read him Bell seemed an extremist, with his claim that if you care about representation then Monarch of the Glen must be your kind of painting and all. Even so, I thought the “significant form” business was real and important as part of what makes art art. As to Romanesque capitals, I specifically had in mind the goofy-looking lions, soldiers, etc. Here’s one at the Met (of Samson and the lion). To me it seems odd to call the figures “decorative,” but the capital seems more engaging as an assembly of forms than a narration, although the figurative and narrative aspects help us make sense of it (just as the functional aspects help us make sense of a cathedral or piece of calligraphy). And with regard to music, it does seem that our response somehow starts with our response to expressive movements, utterances, etc., but there are also the formal aspects that lead people to think there’s something mathematical about Bach’s music (and I suppose led Goethe to call architecture “frozen music”). I entirely agree that one’s cultural milieu can exert a powerful influence. But doesn’t the extent of that influence depend to a large degree on the individual’s self-awareness and rational capacity to evaluate competing claims on his allegiance–not to mention on the strength of character needed to reject the prevailing attitude? And don’t those factors vary greatly from individual to individual? Regarding Bell’s “significant form” hypothesis, if you take it as meaning that there are abstract qualities of form, composition, color, etc. that contribute to a work’s effectiveness as “art,” there would be no problem. Such attributes indeed serve to draw our attention to the work–a necessary precursor to perceiving its content. Bell went much further, however. In claiming that art possesses “an intense and peculiar significance of its own … unrelated to the significance of life,” he explicitly emptied it of all existential significance–that is, of its very reason for being. And his exclusively formalist analysis paved the way for the ascendancy of meaningless “abstract art.” Moreover, you’re right to sense that in citing Landseer’s rather banal Monarch of the Glen as if it were the epitome of representational art, he was extremely unfairly stacking the deck. About the Samson and the Lion capital and others like it, what looks “goofy” to us (accustomed as we are to more realistic work) probably didn’t seem goofy in their time. But for us they aren’t sufficiently coherent to focus thought on the narrative being represented–on the meaning- content of the image. That is why I’d characterize them as essentially “decorative” in our context. Decorative art in all traditions employs figurative motifs, but not in a way that stimulates thought about what is represented.